They are (were?) 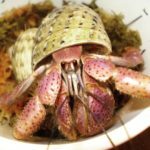 on the Bugs in the Crabitat guide and are harmless. It was how I found out they existed but I have yet to see one in person. Cool find! Not sure if the temperatures are good for them, generally Ohio animals need Ohio like conditions and seasons. Good point, I guess it's good I'm not planning on throwing them in the tank.